The “new realism” I referred to last week has continued into this week. A draft budget was approved by a sub group of our Trustees and will go forward to the full Trustees on 8 February. It is a deficit budget, proposing that we draw heavily on reserves. We know this is unsustainable and so have strategy for the future……which I’m not disclosing! Many voluntary organizations will be in the same position. The calendar year 2011 will be a crucial one for voluntary organizations providing support services in Surrey, for whilst Surrey CC is helpfully maintaining its core funding in 2011/12, there will be a reduction of 30-35% in 2012/13, and so we have to take on this challenge to regain revenue, and/or reduce costs. However, we will be positive about what we have to do, not least in focusing tightly on what our members want. The good news from our members ‘satisfaction survey is that 93% of respondents are either very satisfied or satisfied with our services. This survey gives us a bench mark from which to improve further. move the flagship Outdoor learning Centre to an arm’s length trading unit and eventually to become a social enterprise basis. My view is that these are mostly fairly bold but desirable changes, consistent with the emphasis on Decentralisation and Localism reflected in the Government’s important Bill of this name published this week. The move to a commissioning model is not unusual, but it will be a challenge to define outcomes in a credible way. Turning to other matters we are running a one day Faiths in Action workshop on Wednesday 23 February so that young people and adults of different faiths can talk about what their faith means to them. Details are on our website and a booking form will be available in the first week of January. This is my last day at work until 4 January ….I have to write two long essays over Christmas for my MA Theology, so apart from the usual Christmas family events, carols, and friendship I will be busy typing away in the university library …but in truth I enjoy it hugely! I fear this has been the week when I have come to fully appreciate the impact of the cuts, which has been a dominant theme of meetings this week. The 14-19 Partnership Board had a briefing on the impact of cuts and funding uncertainties in that sector. Whilst the concentration nationally has been on the increase in student fees, little attention has been given to the cutting of Education Maintenance Allowance (EMA) to college students, and its substitution with a new grant, but the published figures show a cut in the EMA from £700m to £70m. This will be a severe disincentive to young people from needy families to go to college. The changes in the Education White Paper are also very significant. Locally, Surrey CC has reviewed its funding support to voluntary sector support service organizations, and whilst it is very commendably protecting core funding in 2011/12, at the expense of the loss of its own staff, all current grant recipients are on notice of a 30-35% cut in 2012. We have just prepared our budget for 2011/12, and will have to draw heavily on reserves, but 2012 looks grim. However at least there is a year to plan, and the words “collaboration and/or merger “ are on everyone’s lips (or should be!). On a more positive note, we are making good progress with Surrey CC colleagues in initiating a social impact bond (see website) and I am delighted that two Surrey CC staff are to be seconded to us on a part –time basis from January to March. If we are all to get out of the predicament of cuts in the public and voluntary sectors, low economic growth, and social disruption it will be through innovation and effective collaboration between the three sectors (public, private and voluntary). We are updating our Doyouthwork.com website to facilitate links to corporates especially about volunteering opportunities for their staff; this is to be re-launched at the end of January. 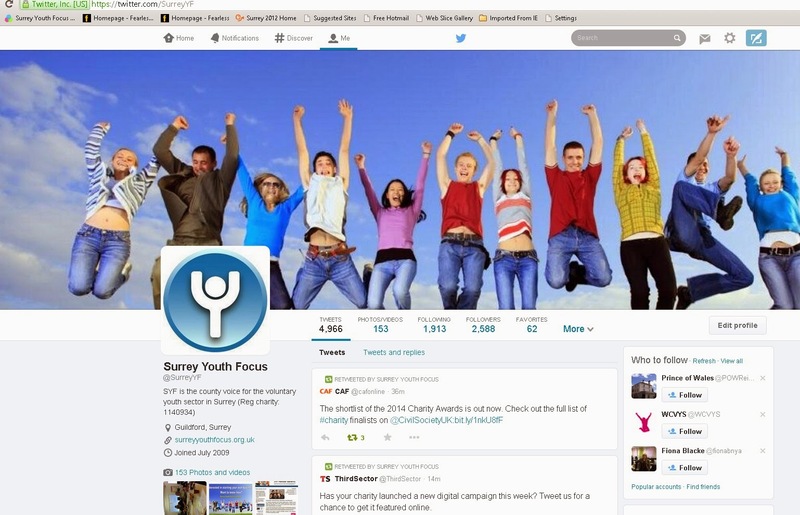 I am also hoping that the two seconded staff can help us to develop our “surrey youth enterprises” site. Another important Big Society development this week is the publication of the new Localism Bill, which includes very significant devolution of powers to local communities about planning matters and transfer of assets (buildings) to communities. And finally ….you will want to know from last week’s blog about my experience of eating sheep’s testicles (sic) at a Turkish restaurant…”tastes just like chicken” ! Mince pies, mulled wine and first carol concert this week-end…much safer! committed bunch and great to work with. Focus and Surrey Youth Consortium are hoping to contribute. More later. football venue, but the English cricketers doing well against Australia! Surrey Youth Focus being an enabler/ facilitator of partnerships. imporant development as an innovative means of funding. consultation sessions on 15 December, and 26 January coming up. This has been a quieter week catching up with the projects which have fallen behind because of other priorities like Pqasso, AGM, and incorporation. So I have written a simple guide to the NCVYS Progress training that I have mentioned before – this is the subsidy to trainers to provide the voluntary sector with core training around safeguarding, health and safety, working with young people,etc and the opportunity of getting trainers trained to be qualified to deliver accredited vocational training – indeed “preparing to teach in the lifelong learning sector" (PtLLS) courses are becoming increasingly evident. My two briefing notes – to employers, and to actual/potential trainers should go out next week. My colleague, Marie Silvester, is just starting the development of a Common Induction Workbook and course for the voluntary youth sector. This builds on the 7 prescribed standards set by the CWDC but adds in two others – the Common Assessment Framework, and a further module on Working with young people. The workbook will point to how/ where to get the training, and indeed I am hopeful that we can run an accredited common induction course. The underlying point is to ensure that everyone volunteering to work with young people can access a minimum standard of induction. I went to a well attended Compact workshop in Epsom on Wednesday at which the Chief Executive of Surrey CC said that he was expecting cuts of £255 mill against their budget of £661m over a four year period. He said that a radical rethink was needed – in relation to how the sectors worked together, on the basis of commissioning outcomes (results) not organizations or services. Surrey Youth Focus and Surrey Youth Consortium have put forward a good few positive suggestions about the radical way forward; it was good to hear today that the Consortium are being cited publicly by the DCLG as an example of good practice , and so too Surrey Youth Focus I understand. Surrey CC’s Big Society conference on Monday with the Permanent Secretary of DCLG should be interesting! Personal Disclosure: More rugby!! Such bad luck (not) Australia ! a) Last week: Waltzing Matilda: According to Christina Macpherson, ‘Waltzing Matilda’ was created in the sitting room of Dagworth Station in January of 1895 with the help of a young solicitor and poet, ‘Banjo’ Paterson. You don’t need to know more! I guess the theme of a busy week is about innovation. I had a meeting on Monday with Business in the Community about the scope for building closer links between businesses and the voluntary sector. This was very positive indeed, and we will be receiving BITC’s project/volunteer request form so that we can log the needs of member organizations with them. In essence they are saying “tell us what you want and we’ll probably be able to deliver it”. I have just met with Yvonne Hignell of Halow about her idea of building what we’re calling a “4X4” model of a small group (4) member organisations to have a partnership with like minded organizations in the business sector that can contribute particular business skills to the group of voluntary organisations. In similar vein, I was at the Surrey Youth Consortium’s awayday yesterday when another visiting speaker from the New Economics Foundation mentioned “Camden Shares” – being a website for the vol sector in Camden enabling spare capacity (meeting rooms, training places, minibuses etc etc) to be logged and utilized by others. I think this is a great idea. Another great idea is to further develop the borough based job clubs for unemployed people. My own short report on social impact bonds has now been circulated widely, and is to be discussed with Surrey CC on 2 Dec.
We had our well attended AGM on Wednesday evening, when we marked the retirement of our long standing Treasurer Alan McMichael, and had great presentations from Ed Baker of Surrey Community Action about Social Enterprises, and from Becky Bowden of Surrey SATRO about volunteering. The AGM approved us becoming a company limited by guarantee, whilst remaining a charity. This completes the putting in of our “concrete foundations” (Pqasso and incorporation) and we can now concentrate on external affairs. Off to Horsham now to meet with WSCVYS about the Progress training project. Personal disclosure: England v Australia rugby on Saturday afternoon. a) Last week’s question: The haka is only performed by the All Blacks, but Samoa, Fiji and Tonga all have their own versions. b) This week: why is Waltzing Matilda so named? I went to the excellent National Council for Voluntary Youth Services AGM in London on Wednesday. Very struck by their close involvement of young people in their operations as an infrastructure body….. Very interesting talk at this AGM on “The Big Society and Young People” by Tim Laughton Under-Secretary of State for Children and Families. His themes were that the Coalition is dead serious about the localism, and the community helping itself agenda. He wants to re- value the altruism of volunteering (and knows there’s a cost to it). Big emphasis on social impact bonds, and the Big Society Bank, which will have a local dimension to it. But the sector needs to consolidate and merge – too many small organizations, needs to be cost –effective. Wants to concentrate on the 99% of young people who are great, not the 1% of young people whose behaviour and circumstances grab the wrong headlines. In particular he wants to: “Challenge the monopoly of local authority youth services”. A similarly interesting talk by the Chief Executive of New Philanthropy Capital on Preparing for Cuts and Innovation. His theme was about how outcomes can be measured, and how he is developing a tool for measuring well- being of young people. Mergers, partnerships, and collaboration are words on everyone’s lips; nationally Clubs for Young People are having merger talks with Catch 22; I have a paper on consolidation in the sector going to my Trustees shortly. The NCVYS Progress training is beginning to gain momentum; heavily subsidized training for the voluntary youth sector becoming available shortly. We have our AGM next week (Tuesday 9 November) when Members will be asked to approve our becoming a company limited by guarantee, and we have speakers on social enterprises and volunteering. We have to keep innovating and developing partnerships. a) Last week: After clocks have gone back - Greenwich Mean Time is so named because (Wikipedia) it is a term originally referring to mean solar time at the Royal Observatory in Greenwich, London. b) This week: As the rugby international season starts this week-end, how many countries perform the Haka at the start of an international match? This has been a quiet half term week on the roads and with emails, so I have had a bit of time for thought about the CSR which I have now downloaded (100 pages). The loss of the School Sports Partnerships will leave a gap, but not as great as the loss of the Education Maintenance Allowances for 16-19s and its replacement with a targeted fund. I am still trying to unpack the impact of the benefits changes for young disabled people, and the requirement that increasing the age threshold for the Shared Room Rate in Housing Benefit from 25 to 35. I have drafted a short briefing note for the Surrey Sports Partnership about safeguarding. It’s worth Sports Clubs remembering that Community Foundation Surrey has a Sports Fund that’s worth applying to. On funding generally, the Big Lottery has just announced a new buildings programme, and I gather Awards for All (up to £10,000 max) have funding available too. I have visited White Lodge and Bletchingly youth club this week – each doing great work in their very different ways. I have also approached a business organisation to see if they can offer us a volunteer organiser to link between our members and corporates and universities; the need for this was identified in our business plan. I have drafted a proposal to Surrey CC about how the voice of the sector might still be heard despite the approach now being taken to dispense with Childrens trusts and Strategies, – all part of the dismantling of the “top down” policies and targets, and to narrow membership of the commissioning executive to budget holders only. We need to ensure that the interests of the sector are heard at the county level. And finally I recommend reading a report by a London charity, Community Links, about the value of community hubs - Out of the Ordinary – surely the shape of things to come. See our website on Monday. Personal Disclosure: On leave on Friday to get some air and have a bit of a walk on the Sussex Downs – my standard 20 miler. a) Last week: median male earnings are £25,000; it seems that Rooney is being paid £200,000 a week – so he earns in a week what it takes 8 “working people” to earn in a year! No comment! Clearly the week has been dominated by the results of the CSR on 20 Oct. and the news of a 28% cut in local government expenditure. This together with all the other elements - students fees, change in homeless benefits for young people, will impact severely on young people. But there are opportunities. There are two interesting Cabinet Office reports just published : one is about the role of the sector in building the Big Society - “Building a Stronger Civil Society” -and the other is the place of infrastructure organizations “Supporting a Stronger Civil Society” ( both on our website). The latter encourages mergers and collaboration between infrastructure organizations. There is £470 m to support the sector, of which £100m is for modernization. Interesting key speaker at the RAISE AGM from the Office of the Civil Society – she spoke of the “paradigm shift “ in central government thinking towards localism and community. There is no doubt that the Coalition Government are serious about devolution to the sector and communities. My question is whether local government will be a conduit to the success of the Big Society, or a block to it. I note that Suffolk and now Kent County Council have decided strategically to outsource/devolve all services, so that they become just an enabling /commissioning body. Interesting. Trustees meeting on Thursday approved our much more informative Annual Report and Accounts, and, very importantly, that we should recommend our AGM on 9 Nov that we become a company as well as a charity, to limit the personal risk to trustees/directors. I visited the Park Barn (Guildford) Youth Club on Monday where Hannah Tugwell is doing great work with 50 young people attending every session, but she needs more help, which is what we were discussing. I have written a draft paper on Social Impact Bonds which are likely to be a really important step forward in securing funding from corporates as the funding contribution of the public sector shrinks. Personal disclosure: A MA Theology working week-end in prospect as I have to give a paper on The Spanish Mystics on Monday evening – anyone know about them? This week’s GREAT news for Surrey Youth Focus is that, subject to the approval of the Charities Evaluation Service, we have been assessed by an external assessor as being fully compliant with all 12 aspects of the Pqasso quality assurance marquee at Level 1.Pqasso stands for Practical Quality Assurance for Small Organisations and is a UK wide quality assurance system. It has taken us two years to get to this point, and so my thanks to the Trustees for supporting this, but most especially to my fellow team members for sticking with it. I would recommend it as a discipline to any charity, large or small. Thanks Jan! Big Theme: Surrey CC “Fit for the Future “ project. We had a useful Keeping in Touch meeting with Garath Symonds (Assistant Director for Young People) who has just returned from paternity leave. We discussed 3 topics: the universal/specialist / targeted continuum and how the sector could contribute at each point; the future use/ management of youth centres, and localism – the devolution of a base budget to local committees (all this subject to Cabinet approval). Met with Hallah Shams of Guilford Diocese to project plan the use of a £6,000 Faiths in Action grant to foster inter-faith relations amongst young people. Excellent meeting, and fun too. Sent out the papers for the Trustee meeting next week, including the Annual Report and Accounts and the arrangements for our incorporating as a company. Great to see a former colleague Janet Crowe today returning to Surrey as CEO of Surrey Age Concern! Personally: Great week-end in London last week-end, and dinner at Magdalen, and was given a very on- trend CD by “Mumford and Sons” a new folk- rock band who are superb – slightly in the mold of REM, out of Kat Stevens/ Fairport Convention. A quiet week- end now- I can’t stand too much gallivanting around! a) Last week’s answer: grass stops growing at temperatures below 5 C, and so we probably can’t put lawn mowers away until early/mid November. b) This week: On the folk -rock theme – which famous (female) singer of undoubtedly the greatest folk- rock group fell down stairs to her untimely death? welcome to Friday blog No 6/10 for 8 October. This week we have been working on a new Members Survey for 2010. The last was in 2008 and we need to update. To simplify matters we have split it into two parts: first a Satisfaction survey - about the extent to which our Members know about, use, and are satisfied with the services Surrey Youth Focus provides. We posted this out yesterday but it can also be completed on Survey Monkey. Then we need to know about the collective impact of the voluntary sector, and this will be reflected in an impact survey, about our Members at the end of October. “Impact “is a key word, and the national body – NCVO have done some brilliant work enabling support service organizations in the voluntary sector to assess their impact. It has a wider application than just infrastructure bodies like us – it’s called the Value of Infrastructure Programme (VIP). Recommended. First, that the NCVYS “Progress” funded training will be out soon – at the end of the month, and this will provide outstanding capacity raising opportunities for the voluntary sector in Surrey . Watch our website , e- bulletin, and blog. Secondly, I went to a meeting of the Children and Young people Commissioning Executive on Thursday, chaired by Andy Roberts, and opportunities are being taken under the new Government’s edicts to simplify and streamline the management and delivery of integrated services to children and young people, and which I have supported. But within this more managerialist approach we must ensure that there is still a process for the voice of the sector to be heard. More later. Personally: A sunny week- end at last! We are off to London to have dinner with our family at a restaurant called Magdalen in Tooley St. near London Bridge, where middle son is joint chef/patron, so a “serious” dinner in prospect! a) Last week’s answer: A Granny Smith apple is so named after the Australian lady who propagated it accidentally at the turn of the 19th century. b) This week: At what temperature does grass stop growing in the SE? We are still very busy internally and had a “Pqasso Team challenge” session on Tuesday to ensure that we have all our ducks in a straight line for the external assessor in two weeks time (we do!) We have taken out a contract to dispose of old archive files and will have spare capacity within the contract to offer as a service to member organizations. Details out soon. Met on Tuesday afternoon with Peter Gordon the new Chairman elect of Surrey Community Action who has an impressive CV from Unilever, consultancy, and Business Link. We had an interesting and strategic discussion. On Wednesday several of us met with Dr Andrew Povey, the Leader of Surrey CC. The outcome is that a small working group will meet in short order to identify key projects underpinning The Big Society in Surrey we should work on together – probably NEET reduction, community buildings, volunteering, changing culture and so on. This initial identification of core projects (which then need to be worked up) will be put to the Surrey Strategic Partnership conference on The Big Society on 22 Nov –Note for your diary. Big Picture: Continuing importance of The Big Society see, or rather listen to, excellent Radio 4 Analysis programme on the political background to it. Here’s the link to listen: podcast http://bbc.in/aOJlA9. Personal disclosure: Staying at the Benedictine Worth Abbey last week – end was a profound joy. I’m running a Myers Briggs session for my church council this Saturday, and taking Evensong on Sunday, so theory and practice come together. b) This week’s question: Since the apple harvest is with us why are Granny Smith’s apples so named? Enjoy the (wet) week- end! Not a lot to report this week, though I am intensely busy on internal matters (Incorporation, Pqasso, Annual report and Accounts and so on). Necessary, but not interesting to readers. So, a few wider reflections. There was an excellent article in The Times on Thursday about the Big Society, referring to a new book by Robert Putnam (author of the famous “Bowling Alone”) in which he points to the importance of faith organizations in providing a disproportionate number of volunteers and community activists, but wondering how social capital will be built as society becomes increasingly secular. By contrast, there is a really important study commissioned by Guildford Diocese - “Faith Communities – The Hidden Contribution” – into the economic impact of the work done by faith communities. I was at NCVYS in London on Thursday at a very useful networking meeting about the Value of Infrastructure Programme, being the title of a programme being developed by NCVO about how to measure the impact of infrastructure organizations. Impressive. We also exchanged thoughts about financial cuts, the Big Society, and new structures. It seems to me that everyone I meet is working really hard against a cumulative background of cuts and increased workload. But I really do think we must have a sense of where we want to be in the voluntary sector AFTER the cuts, and I don’t yet see that vision emerging. My contribution will be to write “think pieces” on social impact bonds, and restructuring. Big Picture: There are positives. I proof read the next edition of Surrey Youth News this morning – it is full of amazing stories about what young people have done: six Girl Guides swimming across the Channel; a disabled young man doing the DoE expedition training in his “off- road” wheel chair; Vinvolved volunteers working on an intergenerational art project with elderly people, and so on. Then there was an inspirational speech by Dame Stephanie Shirley to the Community Development Foundation, Surrey, on Tuesday about the value, and virtue, of philanthropy. See their website. Personal disclosure: Delighted that Wasps beat Leicester last Saturday – great match; this week- end by way of contrast I am off on retreat this week- end to the very serene and beautiful Benedictine Abbey at Worth, near Crawley. No phones, tv, computers, indeed complete silence from 9.00pm until 9.00 am. A joy. a) Last week’s answer: Aphrodite was Greek goddess of Love; Love were a great American West coast group with whom Jimi Hendrix played in his early years! b) This week: (Classical music) 2010 is the 400 th anniversary of which famous piece of classical music (and no.2 in my desert island discs )?? Welcome to my Friday Blog No.3/10. Well the main focus of the week has been preparing for Pqasso, and drafting the Members’ survey…and meetings. We were visited by a potential new trustee on Tuesday for an induction session and to meet our small team; she will make a great contribution to our Board. I had a good meeting with our uniformed organisations on Tuesday evening – Scout numbers up by 4.7%, and so too Guides. Concerns about grant cuts, and how figures of “contacts” are used by grant funders with the risk of double counting. Discussed possible use of youth centre buildings. Feedback on July ‘s Celebration of Youth and preference for an April Celebration next year. Meetings on Wednesday of the Surrey Sports Board discussing the melding together of the established Surrey Youth Games with a new (SCC funded -£250,000) Surrey School Games. Also a new structure of sport competitions from Sport England. I might need to convene a meeting of all our sports organisations. Then equally good meeting of Surrey 14-19 Partnership. Further Education speak / jargon is quite impossible – no one understands it all, BUT there are real opportunities here for some SYF member to get into this arena. We all need to understand the new Qualifications and Credit Framework better. A second round of Faiths in Action grant (£6,000) has fallen into my lap – manna from……the Community Development Foundation…..about which I am linking up with the Guildford Diocese. Big Picture: In London today, Friday, for meeting at our national body, NCVYS, about project planning the launch of heavily subsidised course for the voluntary youth sector. I was part of (another) consortium bid with CVYS colleagues from East and West Sussex that was successful in its bid. More later. Congratulations to Surrey Youth Consortium for its formal launch today. b) This week’s question: What is the link between: Aphrodite, and a great West Coast American Group from the late 1960s, and Jimmy Hendrix?? Welcome to my weekly Friday blog. We welcomed Sophie Webb to join our team this week. She is with us for six months under the sponsorship of the Future Jobs Fund and is a great asset already. She is working on cleaning up our database of Member organizations, so that she and Kate can then undertake a new Members’ Survey. We want to find out your opinions of ours services, and also check out the scale of your activities with young people so that the Voice of Young people can be magnified at what is a tough time. Impact is a key word. So I commend the Future Jobs Fund to you as a source of (free) staff. We have passed through the first stage of the Pqasso process – the desk review of our submitted documents – stacks of them! Next stage is that the assessor inspects us on 13 Oct. The main focus this week has been on getting our Annual Report and Accounts together; we are improving its presentation considerably, recognizing its value as a marketing document to funders. Heard a very interesting presentation by the Chairman of the National Community Foundation Network about the Big Society…. No one builds a pyramid from the top down…. Great discussion last night at the University for the Creative Arts at Epsom under the auspices of Common Purpose, and a presentation by the Dean and Professor of Creative Arts on the subject of creativity – how do we capture creativity and risk taking rather than saying- no, can’t be done, too risky , failure, redundant? He pointed out that in the USA and India mistakes, are just episodes to learn from. Big Picture: Collaborative working, and social impact bonds. Personal disclosure: Had builders in over the last two weeks to renovate our cloakroom….why is it always that builders always muck up something (our central heating) when doing other work? I also got older this week…and wiser? 2) Paul Weller missed out on this week’s Mercury Awards, but despite this, why is he always a winner? Hi everyone, welcome to Mike’s Blog through which I want to keep you up to date with what we’ve been doing in Surrey Youth Focus, and my personal opinions on what’s affecting the voluntary community and faith sector – hereafter “THE sector”. There will also be some personal stuff from me, but not of the sort that will make the front page of the News of the World (I hope!). To be slightly serious I am not intending to name individuals with whom I’ve had contact in the week as I need to continue to work with many colleagues in local authorities and the sector, and I don’t want to be shunned, so…your secrets are safe with me!?! This last week has been dominated by meetings about the Connexions service, and the future contracts for the voluntary sector. As a result of the last meeting on Thursday evening with the Surrey CC’s Assistant Director for Young People and colleagues from the Surrey Youth Consortium I have an optimistic feeling that good progress can now be made. The other theme to the week has been sending off Pqasso documents (about 35!) to the external assessor who will be visiting us on 13 October to assess whether we meet the Practical Quality Assurance for Small Organisations Level 1 standard. More on this later. The prospect of budget cuts to Surrey Youth Focus is a concern, though we have strong reserves. I had a performance review meeting with the Surrey CC providers of our core funding, and I have had intimations that current funding levels may not be sustainable next year, though our value is not doubted. Talking of which, we have just got another £20,000 grant from the CWDC to put together a standard Induction Programme for new workers/ volunteers into the sector. We’ll be producing and printing workbooks for new staff/ volunteers so that they can record each element of induction training received – Safeguarding, CAF etc. We welcome Sophie who starts with us on Tuesday to work on a new Members’ Survey; her post is funded by the Future Jobs Fund (and so free to Surrey Youth Focus) and I would encourage colleagues to recruit through this scheme. Big picture: Importance of social enterprises, social impact fund, and social return on investment – more on all these later. Personal disclosure: brilliant week – end a few weeks ago camping with my three sons, and grandson (age 2) in Weymouth, Dorset, and seeing Toy Story in 3D. Great! Trivial Pursuit: What’s the connection between Plato’s Cave, and The Family? (great late1960s Group). Answer next week.